800 is a magical number. 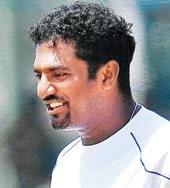 For Murali, it is a fitting number to be associated to. Having reached there, at the pinnacle one expects a huge ego and pride. Murali is all but that. He was a picture of simplicity and down to earth. At home, Sachin matches the same attitude. Here is saluting the legend Murali is.